I made the trip out to Asheville this weekend for the Southern Conference tournament. 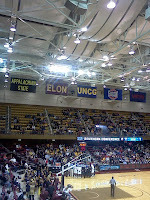 While I was there to support UNCG, the ultimate decision to make the trip was helped along at least in part by the lure of seeing eight of the 12 pep bands in the conference live. I started out around 8 or so on Saturday morning. Asheville sits about three hours to my west, and the first game--UNCG's--tipped off at noon. On the way up, when stopping for breakfast, I was pleasantly surprised to come across a couple of young ladies--presumably students--also headed westward. Getting into town, I was reminded that Asheville, where I've spent precious little time, is a damn cool city. The short walk between the deck where I parked and the arena took me past quite a few cute little shops and eateries, and walking that drag a couple more times during the day took me past street musicians and a generally vibrant community. Walking towards the arena, I almost got hit by a Western Carolina fan turning a corner. He paused briefly and, noticing my UNCG apparel, told me to be sure to beat App State. Yes, the Battle for the Mountain Jug is alive and well out that way. Headed into the arena, it actually felt quite a bit like what I remember from the NEC tournament, though I haven't attended that one in a decade. I walked in right next to the UNCG pep band (actually just shortly after having gotten a tweet from the director) and rested there for a moment before settling in behind the basket, still adjacent to the band. The first half was a bit tough on the Spartans, falling behind App double digits and being pushed around inside by the Mountaineers' beast of a center, Butts (12 year old humor not lost on me). Both bands were holding their own, though I'll confess it's easy for me to be stagnant on the Bands of Sparta since I hear them at home. App State did bring an advantage in the horn swing department, but their tunes seemed all built for short timeouts, often leaving them space before play resumed. The Spartans rallied in the second half, and ultimately won going away, 65-55, advancing into the semifinal round. I did a bit of walking around on the concourse following our game, running into some fellow UNCG employees, who were headed to a nearby postgame social. They invited me along, but I had dedicated my day to basketball and pep bands. I've got no regrets in doing that, but again, given the city of Asheville, I wish I would have built a little time in to just enjoy that. For the games that follow, I admittedly had more of an interest in the bands than the basketball. As such, I moved around and got close to each band (I didn't do this during the Spartans' game, so my apologies to App fans looking for their band). The second game of our session was Western Carolina vs. Wofford. Western's band was probably my favorite of the day, and that probably makes sense, as their cut from the cloth of a Sudler Trophy-winning band. Western's contribution to halftime was their indoor drumline, Purple Thunder Productions. This was a welcome treat, and they were well-received by the folks assembled. There was a bit of a clash of styles between Wofford and Western; Wofford, with a bass, tuba, and bari sax driven low end came off more as a jazz combo with a horn section, which Western favored a brass-heavy sound. It's also worth noting that in each game, the bands were not on equal footing. The designated home band was in the corner on one end of the court, while the visiting band was along the endline on the opposite side. Western's win over Wofford ended the first session, but being there only for Saturday's games, I bought tickets to both sessions. It was my intent to head back to the car between sessions to charge my phone (the Droid battery life struggle is REAL) and when making my exit I realized that the arena could re-scan tickets for re-entry. Having been used to no re-entry policies, this was a new one on me, but a welcome bit of information I tucked away for the second session. Headed back to the arena, Davidson-Furman was on deck next. My big takeaway from this game was that it featured the least horn swing from the two bands. Davidson went with the common rugby-striped shirt as their pep band attire, and in their colors of red and white, they resembled Waldo. Davidson was one of the ensemble whose director also played an instrument, a red trombone in his case. One of Furman's conductors was a woman, and it only just then dawned on me that I don't see that a whole ton. I cut out from this game, an eventual Davidson victory, a little bit early to take advantage of the scan-out policy. I headed down the street to a crepe place and enjoyed a meatball crepe (don't knock it till you've tried it) and a bit of the Duke-Carolina game before heading back in for the nightcap, Elon vs. Georgia Southern. If I recall correctly, GSU was the one band that didn't use electronics at all. Their brass sound was huge, easily the biggest low end wih five sousaphones. Elon, was notable in that I believe they were the only tuba section (of one) to opt for a contra instead of sousaphones. That said, I only made it just past halftime on this one before hitting the old dusty trail and taking the 3 hour return trip I had ahead of me. I've got the photos and videos from my day up on the 80 Minutes Google+ page here. Having wrapped up this trip, I enjoyed being there for the Spartans, but enjoyed just as much being there for the rest of the basketball and pep band action. With that in mind, while I may consider following UNCG up the hill again next year, I'm considering instead taking the trip--only slightly longer at 3 1/2 hours--up to Richmond for the CAA tournament. There's a touch of local interest in that they've got east coast based teams, including my home state Delaware Blue Hens and Baltimore crosstown school Towson, but more importantly, they take pep bands seriously up there, so much so that they host the Breakfast with the Bands Pep Band Jam each year. That's a conference tournament I can get behind.